Hiroshi Tsuyuki presents 11 basic projects in Basic Wax Modeling, each one designed to teach the use of certain tools and types of waxes in a progressive manner as one's skills improve. Each step of every project is illustrated by photo/text and is some cases supplementary diagrams and notes are provided to clarify those particular processes. After each basic model is completed a number of illustrations are provided suggesting design possibilities using the techniques learned in the construction of the basic model. This book makes it very easy and enjoyable for the beginner to learn wax modeling and illustrates how practical wax modeling is for jewelry design. Highly recommended for anyone with an interest in learning to model in wax and cast. Hard cover, 7.5" x 10.5", 106 pages. Practical Wax Modeling continues on with advanced techniques and topics, building on the foundation of techniques and information presented in Basic Wax Modeling. 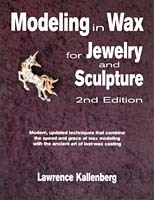 Chapters include Hard Wax Modeling Techniques, Soft Wax Modeling Techniques, Modeling Techniques with Gemstones, Other Wax Techniques, Casting Processes and Rubber Mold Making, and Processing and Finishing After Casting. Projects include Textured Ring, Two Part Ring, Ring with a Floating Twist, Built-Up Ring, Hollow Pendant, Brooch Using Hard and Soft Wax, Brooch with Realistic Modeling, Embossed Figure Brooch, Floral Pattern Ring, Ring of Wax Wire Construction, Making "Mitsuro" (Beeswax), Mitsuro Ring, Mitsuro Brooch, Mitsuro Pendant, Modeling Mitsuro with Other Materials, Free Forming, Cabochon Mounting for a Pendant in Soft Wax, and Cabochon Mounting for a Ring in Hard Wax. Highly recommended for anyone with an interest in learning to model in wax and cast. Hard cover, 7.5" x 10.5", 151 pages. Wax work is actually the least expensive method of getting involved in jewelry making, for you can design your own pieces using low-cost materials and very few tools. The work can be done as easily at home in your own front room while you are watching TV as well as in the workshop. Casting, however, can be a costly investment in equipment depending upon which type of casting technique you choose, and cannot be as conveniently done at home. Many persons only do wax designing and have the casting done elsewhere by a professional caster, leaving on the clean-up work and the setting of stones for the designer to worry about. However, Cast-A-Way shows you the way the professional jewelers work, and these methods and techniques might easily be put to work in your home, depending on the space available. Chapters include Free Form Rings, Wax Weight for Casting Metal, Sprueing, Investing and Burn Out, Casting, Pickling and Annealing, Polishing, The Bombing Process (Plating), Rubber Mold Making and Stone Setting. Soft cover, 8.5" x 11", 61 pages. Centrifugal or Lost Wax Jewelry Casting presents information on rubber mold making, casting waxes and forming techniques, spruing and investing, burnout, centrifugal casting machines, metal melting and casting procedures, finishing operations, jewelry casting metals, white metal casting and gold refining. Well illustrated with photos and drawings. Soft cover, 8" x 10.25", 143 pages. The Complete Handbook of Centrifugal Casting explains the casting process and all the theory behind it. Ordinary, super and ultra centrifugation are defined, plus there are in depth explanations of homogeneous and heterogeneous material systems, mold and cavity radius, molding and mold pressures, mass and centrifugal force, and info on how to select and use every type of mold. Includes alloys, specs and characteristics of the most popular casting metals, zinc anodizing, silicone rubber molding, vulcanizing and much more. Contains a range of projects and applications you can try in your own workshop. Soft cover, 5" x 8", 256 pages. 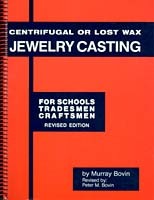 The Handbook of Lost Wax or Investment Casting is a how-to manual that shows you how to make the equipment you will need as well as how to use it to make patterns, molds and castings for jewelry and small metal parts. Soft cover, 5.5" x 8.5", 64 pages. Creating jewelry in wax is designing with a versatile, pliable medium which is receptive to a variety of working techniques, forming easily to the desired shape. The wax piece is realized through the casting process which utilizes the fluidity of molten metal to create forms and effects that cannot possibly be achieved through metal fabrication. Through the process outlined in this volume, you will learn how to effectively use carving wax to express your ideas and create harmonious designs. The technique of jewelry modeling is presented with meticulous step-by-step instructions and drawings revealing the progress of each model. Lavish illustrations and isometric views indicate the dimensions of the model at every stage and the position of the hands or tools during the modeling process. Lessons include Man's Ring, Lady's Band, Pierced Ring, Buckle Ring, Pave Ring, Heart Ring, Oval and 8 Baguette Ring, Baguette Ring, Basket Ring-1, Basket Ring-2 and Ballerina Ring. Each lesson introduces new projects in wax modeling, gradually broadening your ability with emphasis on developing hand skills and attention to detail. As your technical versatility increases, your attention is guided to other aspects of the modeling process, such as working from perspective illustrations, making your own sketches and creating layouts with stones. Jewelry Wax Modeling also contains practical information on tools and stone setting, instructions on creating your own templates, and answers to the most frequently asked questions. Highly recommended. Hard cover, 9" X 11.5", 159 pages. Modeling in Wax for Jewelry and Sculpture presents wax modeling techniques in a concise, step-by-step format. Lawrence Kallenberg details the necessary tools and materials and tools, and introduces the reader to their various characteristics and roles in the jewelry making process. He guides the artist through the various processes of wax modeling in several projects. Among the topics covered are the process of lost wax casting, equipment, jewelry design, making wax models from molds, wax carving, wax build-up, production models, sheet and rod wax, accidental effects, specialized wax techniques and finishing the metal model. Soft cover, 8.5" x 11", 256 pages. Practical Casting explains many aspects of small scale casting with clarity and comprehension. Readers will appreciate the hundreds of helpful drawings, and advanced craftspeople will find shortcuts that make their work more efficient. 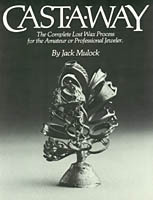 Included is instruction in the traditional lost wax method from modelmaking through investing and burnout to the casting itself. Later chapters teach sand casting, and direct methods like cuttlefish and bronze casting. Highly recommended. Hard cover, 6.5" x 9", 153 pages.